The Grand Procession brings together a vibrant and varied mix of the traditional, contemporary, and Austin “weird”. 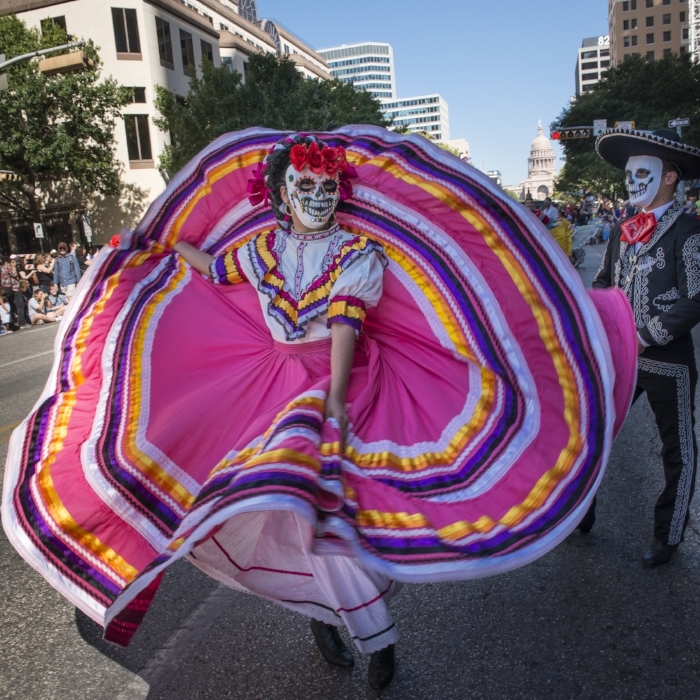 The Procession – including costumes, props, live music, dancers, and floats – marches down historic 6th Street and culminates at E. 4th Street and Congress Avenue, marking the transition from the afternoon to the exciting evening portion of the street festival. Location & Route: The parade will gather on 6th street between I-35 Southbound Frontage Road and Red River street, and travel west on 6th street to the festival location at 4th and Congress. 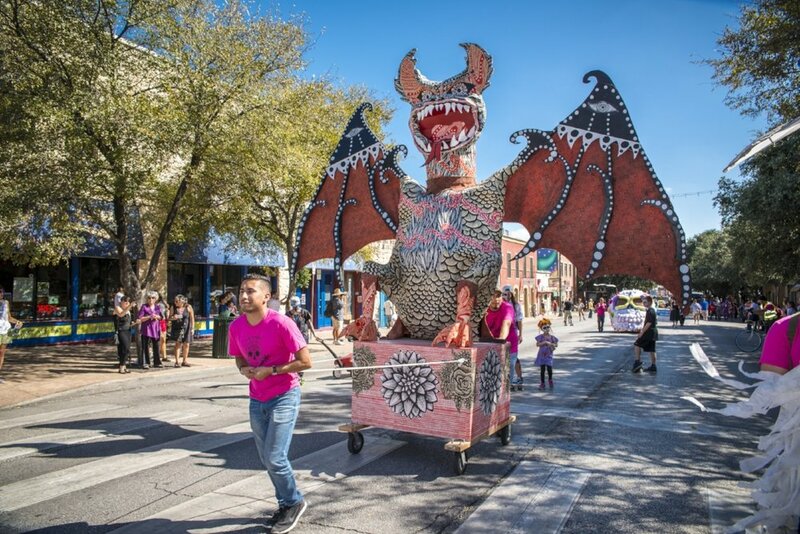 The Grand Procession brings together a vibrant and varied mix of the traditional, contemporary, and Austin “weird”. 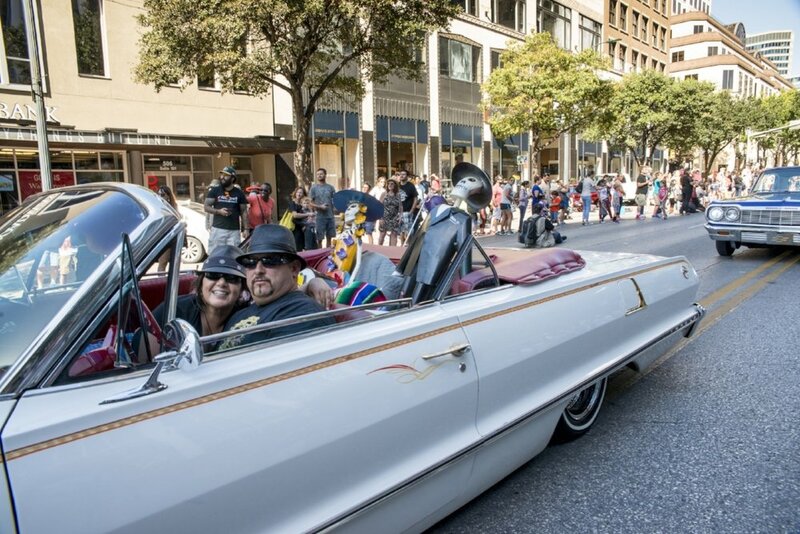 The Procession – including costumes, props, live music, dancers, and floats – marches down historic 6th Street and culminates at E. 4th Street and Congress Avenue, marking the transition from the afternoon to the exciting evening portion of the street festival. View examples of the parade sections below! The theme of the 2018 Viva La Vida Parade is alebrijes. Pre-Columbian Americas refers to the time period when indigenous civilizations flourished in the Americas, such as the Aztec, Maya, Toltec, Olmec, Mixtec, and Inca. During these times, death was not feared, but rather celebrated and ritualized. Life, full of uncertainty and hardship, was a passage or journey to a heavenly afterlife. Participants in this category among others includes: Aztec and Matachine Dancers, Drumming, and Chihuahua Dog Associations. Colonial Mexico: Marked by the Rule of the Spanish Viceroys in Mexico and the position and power of the Roman Catholic Church. In accordance with Catholic mourning practices, All Saints Day was merged with Day of the Dead to become a time to honor and remember loved ones who have passed. The tradition evolved to incorporate Catholic imagery and became a way to welcome back the spirits and celebrate their brief return to the earthly world. This group features European imagery and altars. The beginning of Porfirio Díaz’s rule in Mexico resulted in the creation of a new Mexican national identity based on its Pre-Columbian past and manifested in Mexico’s modern arts. In 1913, José Guadalupe Posada created a famous print called "La Calavera de la Catrina" as a parody of a Mexican upper class female. In addition to the indigenous and Catholic traditions, the satirical portrayal of death in the form of a skeleton has since become associated with The Day of the Dead. This section includes La Catrina, Soldaderas, Revolucionarios, Frida Kahlo, and Ballet Folklorico. Happening now in Austin! Be a part of history and help us create a new fusion of Mexican Día de los Muertos and American Halloween traditions. Austin Weird category includes everything else.